PLOT:Manipuri actress Surja Bala was signed to play Assi, a student who comes to Kerala to study engineering under the north east quota. The actress who makes her debut in Malayalam plays Dulquer Salmaan's love interest in the film. 18 -year -old Bengali actress Ena Saha was roped in to play Sunny Wayne’s lady love. She played a village belle, Gauri and her shoot happened in Visakhapatnam. Joy Mathew was cast to play Dulquer Salmaan's father's role. Anchor Pearle Maaney stated that she had a prominent role in the movie and the shoot was held in Orissa. Paloma Monappa said that she had done the role of a surfer, also making her Malayalam debut. A Kochi-based adventurer Bobby Zachariah Abraham had done the role of a biker. According to sources in the industry, despite its picturesque landscape, filmmakers have always stayed away from the north-east region of India citing security reasons. They also point out that the hard terrain with its hilly regions make it difficult to shoot there. However, director Sameer was all set to take up the challenge and was looking forward to the Nagaland shoot. 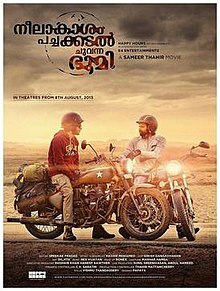 The film was shot in Government Engineering College, Thrissur and a few portions in Ayyanthole including the strike scene of students. This film's first official teaser released on June 22 in YouTube and got largely positive reviews from the viewers. The movie was released all over Kerala on 9 August.